Kevin Lynch's hurler Liam Hinphey who has retired from inter-county duty. Derry Senior Hurling manager Tom McLean has confirmed that senior hurlers Liam Óg Hinphey, Kevin Hinphey and Ruairi McCloskey have retired from intercounty duty. All three players have given tremendous service to Derry and the game of hurling over many years and McLean said he wished them well for the future. “I would like to wish the three lads well in their retirement from intercounty hurling. They have been a pleasure to work with at all times. These men given great service to Derry hurling, from underage right through to all the years they played senior. County chairperson, Brian Smith, paid tribute to service the players gave to the Oak Leaf. “There’s a certain regret when players of the calibre of Liam, Kevin and Ruairi decide to call it a day. Derry hurling stalwart Kevin Hinphey in action for the Oak Leafers. “However, we must be mindful of the lives that these young men have outside of the game and be deeply appreciative for the service that they have given. 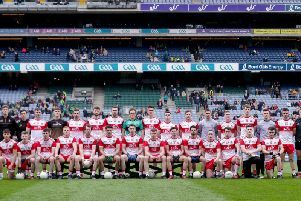 They have left us with great memories and inspired others, and on behalf of all Derry Gaels I want to thank them for all their commitment and efforts. They will be a big loss to the Derry hurling squad, but as time moves on, priorities change and these lads now have wives and young families who need their time. Banagher's Ruairi McCloskey in action against Wicklow.